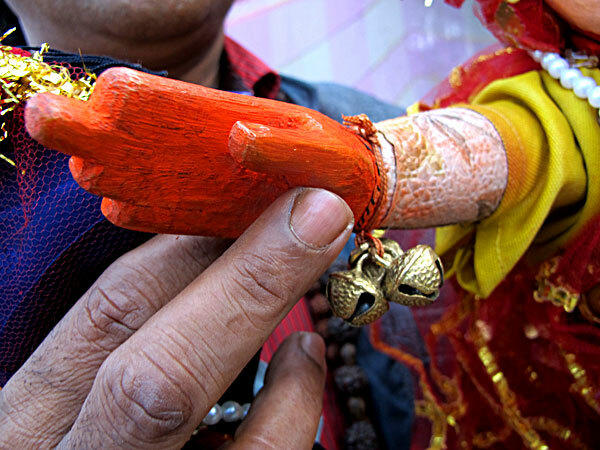 Traditional forms of puppetry found in West Bengal are rod (Dang), glove (Beni or Bene) and string (Taar), of which the glove puppet is probably the oldest form. Both Dang Putul and Beni Putul are indigenous to Bengal while string puppetry was possibly an import from Rajasthan. The roots of the Beni Putul tradition lie in East Medinipur and there were several villages in this zone where the form once existed. 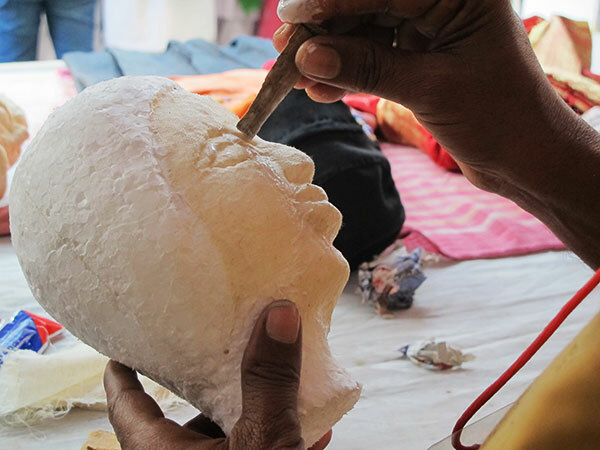 However, today, Padmatamali in East Medinipur is the only village where the form can be found – with only a handful of traditional glove puppeteers struggling to keep their art alive. Traditional forms of puppetry found in West Bengal are rod (Dang), glove (Beni or Bene) and string (Taar), of which the glove puppet is probably the oldest form. Both Dang Putul and Beni Putul are indigenous to Bengal while string puppetry was possibly an import from Rajasthan. The roots of the Beni Putul tradition lie in East Medinipur and there were several villages in this zone where the form once existed. 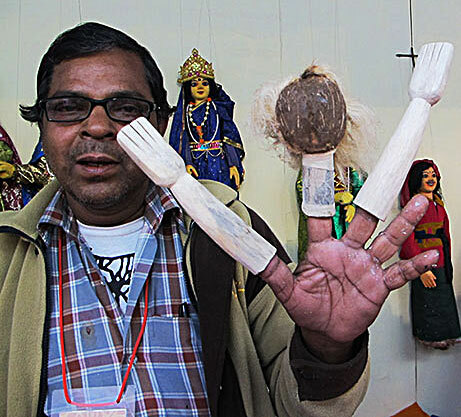 However, today, Padmatamali in East Medinipur is the only village where the form can be found – with only a handful of traditional glove puppeteers struggling to keep their art alive. In fact, there is a government signboard at the entrance to the village which reads "Padmatamalir Beni Putul Gram". Padmatamali village falls under the Bhupatinagar poloce station of Bhagwanpur II block. The Beni Putul puppeteers who traditionally belong to a social group in the lower strata of society, have carried on this tradition for generations together. Prolific in creating new songs, they would go from door to door demonstrating their performance in return for alms. They would also visit local fairs and festivals, often in neighbouring districts. Squatting on their haunches, they would extract two often well-worn puppets and proceed to enact scenes about Radha and Krishna or from the Puranas and manage to eke out a living in this fashion. Since education among this community was not prevalent in the past, children of the puppeteers would also accompany their parents, learning the art as they went along. Their audience was usually restricted to the women and children of their village. But they did not always receive respect from others in the village who equated their performances with beggary – receiving alms without any any real labour. Such insults often drove them farther away, to other villages. But the real culprit in the near extinction of this form is the advent of modern entertainment. Some thirty or forty years ago, there used to be at least seventy or eighty families but now the number has gradually come down to less than ten. The origin of the word Beni or Bene is unknown. However, artists insist that this evolved from a collective decision: Beni in Bengali refers to the plaits that long haired women of Bengal wear: the hair is divided into 3 parts and braided together. The village woman would often fold her plaits back and tuck them to her head. Similarly, the Beni doll, whose two hands and head are manoeuvred by the 3 fingers of the puppeteer, can be folded up, tucked into a cloth bag or large handkerchief and carried away. Another school of thought prefers the word Bene – the colloquial for the term Banik, which means trader in Bengali. Since the puppeteer would ply his art in different places, squatting at village markets or fairs with his bag of goods, and get paid for it (mostly kind), it was likened to a trading activity. 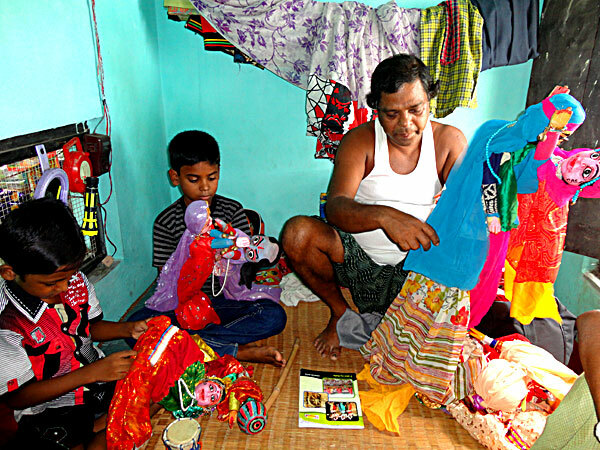 Family members, especially the women, help in making the puppets. The face is first made from clay. This is then baked in the kiln, painted with facial features and then readied for performance. Since the hands are used to clap briskly, providing a percussive beat to the song, they are always made from wood, so that they don’t break off easily. 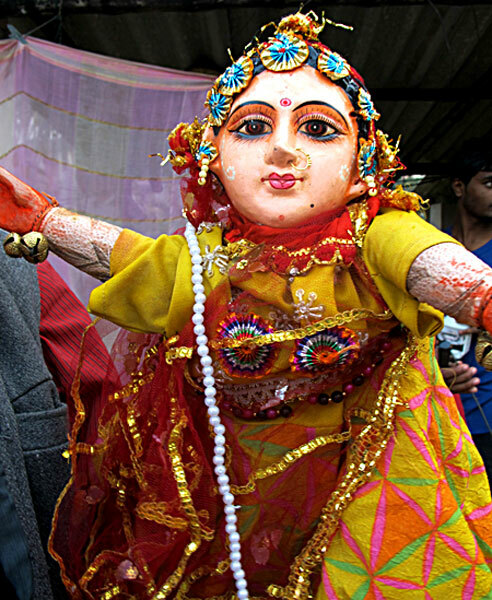 The female puppet is adorned with colourful clothes, bangles and bells tied to the hands. It is always given a veil – which is used in accordance with the theme of the performance - to cover the face in the presence of an elder or to indicate bashfulness. The height of a fully dressed puppet is usually no more than 2.5 feet. Hidden under the clothing, on the back of each puppet, is a glove like appendage. The thumb and middle finger are used to manipulate the hands through this glove, while the forefinger is used to manipulate the head. The puppeteer sings himself as he manoeuvres his puppets.  There is no set format for the movements and there is no stage. Sometimes, the puppeteer is accompanied by a Dhol player. After each performance, the dolls are folded up in a particular way, in readiness for the next performance. The use of clay made the dolls very heavy. Thus manoeuvring them and also transporting them from place to place, was difficult. 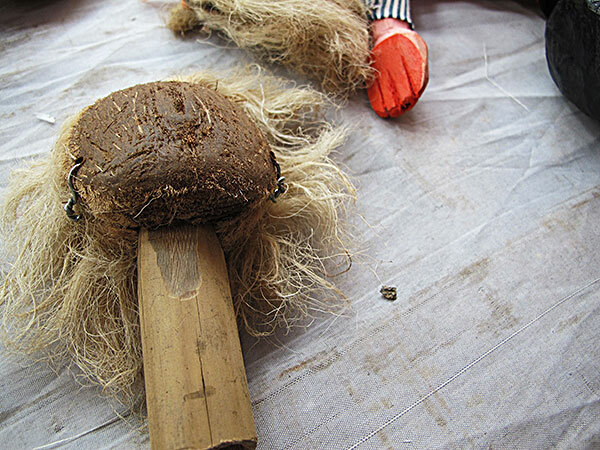 Around the year 2000 or so, with assistance from the government, training and workshops on puppet making was offered. Lighter mediums like sawdust, thermocol (polystyrene) and papier-mache were recommended – the medium of contemporary puppetry. The earlier themes were mainly Puranic, revolving around the lives of Hindu and folk deities like Manasha, as well as stories from the epics – Draupadir Bastra Haran (the disrobing of Draupadi), Kangshobad (the slaying of king Kangsha) for example. The ballads would often be presented in a question-answer form, with the puppeteer himself providing both the question and the answer. Being illiterate, the ballads were usually composed by local village poets. Sometimes, ballads would also be composed on comic themes – a fight between two co-wives or between mother-in-law and daughter-in-law. Post independence, the ballads have undergone a transformation. The themes are more modern, dealing with social and environmental issues or even women’s empowerment. The government has, for some years now, been using them to spread awareness about population control, HIV aids, need for education, treatment of snake bites, drug and alcohol addiction, child marriage and child labour and the need to protect the environment. With increasing urbanization, the language too has lost its traditional regional flavour. There is a quaint local legend related to the origin of Beni Putul. The puppeteers claim that during the British Raj, an old man in their village once mistook the large pale seed of a palmyra fruit with its pale fibres, for the head of an Englishman. On realizing his error, it occurred to him that the discarded seed of the fruit could be used as the head of a puppet. This is probably why the tradition of Beni Putul began with using the palmyra seed as the puppet head. This was later replaced by a clay head. The Beni Putul puppeteers could never completely rely upon their art as a means of sustenance and always had to seek additional employment. Traditionally, they would depend on invitations to perform at special occasions in the village or at the homes of the zamindars (landowners). They were always paid in kind and often, the honour of being invited to perform was sufficient recompense. There was a time when, at the end of a day’s labour as palanquin bearers, they would congregate to entertain themselves and others around them enacting ballads or folk tales with their dolls. In today’s scenario, the puppeteers eke out a living mainly as rickshaw pullers, coolies or van drivers. But in spite of recurrent hardships the love for their art never diminished. They insist that the puppets are their only recourse in hard times. Should crops fail, or rivers flood their banks, or jobs be lost, they can always turn to their traditional occupation to sustain themselves in some way. Though much research has been conducted, not much has been done by way of actually empowering the artists. In addition to their poverty, there is no longer any demand for this kind of traditional entertainment. Old timers who attempt to uphold their art by performing at the behest of local political campaigns often become innocent victims of political violence, having been marked as belonging to a particular side. Furthermore, with the spread of urbanization, there is a widening gulf between the current generation and the previous. Yet, the keepers of this heritage refuse to give up hope. While most have folded their dolls away, the old masters are often encouraged to collaborate with the few families who have managed to uphold this tradition. There have also been recent successful attempts to train the children of the village – and at least one youngster from a neighbouring village has picked up this art.